First, some history. 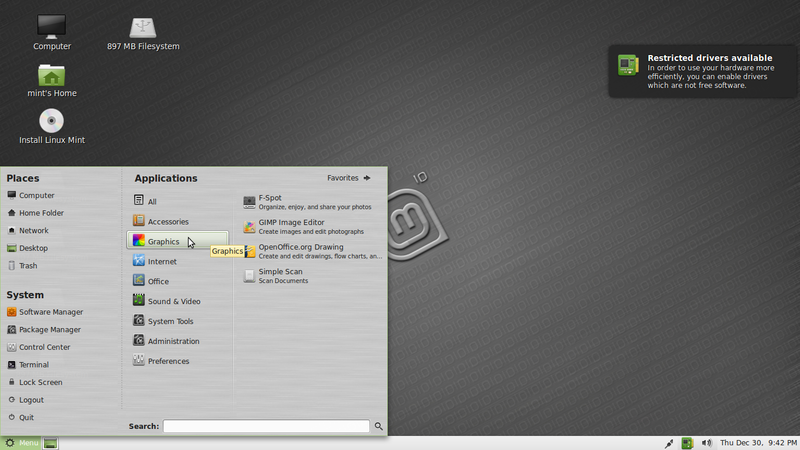 Linux Mint was started in 2006 with the release of version 1 "Ada", based on Kubuntu 6.06 LTS "Dapper Drake". 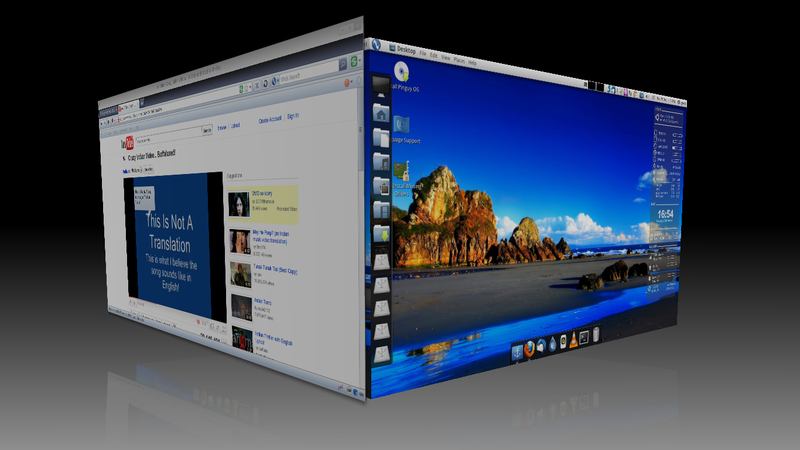 Though that release was KDE-based and unstable then and was seen as Kubuntu with a few extra goodies, it has since been developed into a mature, feature-filled, GNOME-based distribution in its own right. 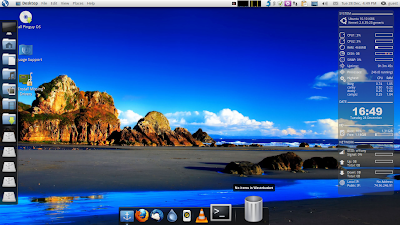 On the other hand, Pinguy OS is a much newer project, having started in 2010 with the release of version 10.04 (based on Ubuntu 10.04 LTS "Lucid Lynx"). It too is a feature-filled GNOME-based distribution, so it's only fair that it go head-to-head with Linux Mint. Both distributions aim for a very friendly user-experience and aim for new users, many of whom are probably migrating from Microsoft Windows. Also, both aim to include as much relevant software as possible to make things easier for newbies. Thus, in this test, I'm going to look for polish throughout the process, the applications and drivers included, goodies like desktop effects, clutter (or hopefully a lack thereof), and speed/hardware footprint. I'm going to test the live modes of each distribution on a live USB (made in UnetBootin) plugged into my ASUS U30JC laptop. As both are based on Ubuntu and have live sessions supposedly representative of installed sessions, I'm not going to test installation. In the interest of fairness, I will test Pinguy OS first, and then see how Linux Mint stacks up afterwards. Continue reading to see how each distribution fares. Pinguy OS is supposed to contain a lot of stuff, so at 1.3 GB, the ISO download is pretty hefty. You will need a DVD or a USB stick of at least 2 GB capacity to make a Pinguy OS live medium. After making the live USB, I restarted my computer, changed the BIOS to allow for USB booting, and started Pinguy OS. I was greeted by a standard UnetBootin Syslinux boot menu, followed by a very nice-looking boot splash with the Pinguy OS logo and an animated spinner below it. The boot process itself was quite fast, taking at most 10 seconds to go from the boot menu to a usable desktop. The default desktop looks nice but a little cluttered at first sight. Even the background, in my opinion, has a little too much going on. Maybe that's just me. Anyway, apart from that, also present are a GNOME panel on top, two instances of the Docky dock program, and a Conky system monitor setup on the right. The bottom dock contains pinned applications along with a window switcher, while the side dock contains shortcuts to frequently accessed folders as well as removable drives. Unfortunately, the side dock obscures the desktop icons (but will disappear if a window overlaps with it), while the bottom dock doesn't disappear, so together they take up a bit too much screen real estate. 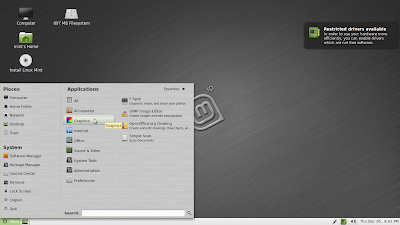 The GNOME panel contains (wait for it), from left to right: a Mint Menu, a global menu panel applet, a Webilder album creator shortcut, a system monitor, a network monitor, a notification area containing the Linux Mint Update Manager and other applications that may get pinned there, a shortcut to the Granola power management application, a GNOME-Do shortcut, and an indicator menu containing a network manager applet, a clipboard applet, a virtual desktop list menu, a keyboard layout switcher, a volume control applet, a chat/email menu, a clock/calendar applet, and a "Me" menu chat applet. Now can you see why I say it's a bit cluttered? Speaking of the background, it seems to change every 10 minutes or so, cycling among pictures in a certain directory. That's pretty cool (though it is does use a fair bit of RAM)! In terms of themes, Pinguy OS 10.10 looks great. The default icon set is Elementary, which is one of my favorites, while the default GTK theme is eHomoSapien, which perfectly complements the icons and is a good deal easier to see than the default Elementary GTK theme. As with all my other reviews, I like adding screenshots. My personal preference is KSnapshot, because although it is a Qt application and I use the GNOME version of Linux Mint, it's fast and it has a lot more features than the standard GNOME Screenshot tool. I figured that I wouldn't have that luxury here, so I depressedly opened the Mint Menu in the "Accessories" category only to find something so much better: Shutter. It's not the most intuitive application, but that's because there are so many features that it seems a little disorganized. As in KSnapshot, Shutter allows for time delays and for different sections of the screens (either open windows or user-defined sections) to be captured, but it also allows for capturing of menus, tooltips, and website pages. In addition, it has a built-in basic image editor as well as an export tool. Color me impressed! There's a whole bunch of other software included as well, which accounts for the relative heft of the ISO file. Along with the usual suspects, present are Skype, Deluge, Dropbox, Frostwire, Ailurus and Ubuntu Tweak, WINE and PlayOnLinux, UnetBootin, and VirtualBox. This is by no means an exhaustive list (but I'm exhausted). There are a couple other nice things about the desktop itself. Clicking on the application name in the global menu brings up a search box allowing users to search for files and applications. Also, GNOME-Do is present to fulfill this. Nautilus Elementary is installed with all tweaks enabled, as are Gloobus Preview (an extraordinarily versatile and lightweight previewer) and CoverGloobus (an extension of Gloobus Preview to include album artwork for songs). At this point, I fired up Mozilla Firefox (no pun intended, really) to perform some simple tasks. Though it is still at version 3.6, there are a whole bunch of tweaks that make it look a lot like version 4, from the theme to the tabs-on-top layout to the moving of the menu below the navigation bar. It also has a lot of my favorite sites, like Gmail, Facebook, Wikipedia, and YouTube, as well as a whole bunch of interesting video, torrent, music, and shopping sites as bookmarks already. It's almost like the developer read my mind. Wow! Of course, it has all the usual codecs already included, and it even seems a little faster than normal. After that, I took a break and tried suspending the laptop. It didn't work. I'm not going to hold that against Pinguy OS. It's just that I thought at this point the suspend/hibernate issue would be fixed, and I was wrong. There are a couple of other nice things about the desktop, and here I'm mostly talking about desktop effects. The translucency in the window decorations for inactive windows works well with the GTK theme, and I'm happy to say that effects like the desktop cube and 3D windows on the cube all work out-of-the-box. In fact, the desktop cube even has a nice shiny background. The minimize/maximize effect intentionally mimics that of Apple's Mac OS X (as does the cursor, for that matter), which is also nice. In terms of hardware, my integrated webcam (and mic) was recognized by Cheese Webcam Booth (which I installed in Ubuntu Software Center, more on that later) out-of-the-box. Unfortunately, Skype refused to sign me on in a timely manner. That said, there are a few nits I need to pick with Pinguy OS. In OpenOffice.org, the scrollbars don't show up right; I've never seen this before, and I'm not really sure why this is. Next, there's no consistency in naming what is usually called "Trash": in one place it's called "Wastebasket", while in another it's called "Rubbish Bin". Next, the default keyboard layout is British English, which got a little annoying for me as all my quotation marks ended up as "AT" symbols. Other than these few minor issues and the dock quirks, I am extraordinarily pleased with Pinguy OS and could certainly see myself using it on a daily basis. The Elementary project has a distribution out called Elementary OS which is supposed to encapsulate all of the Elementary tweaks, but I think Pinguy OS takes that concept to a whole 'nother level. Now, let's see how the distribution I do use on a daily basis stacks up. The Linux Mint 10 GNOME standard ISO file is a bit more than 800 MB, which makes it a good bit lighter than Pinguy OS 10.10 (for downloading). We'll see what this means in the live session. I made the live USB, restarted and changed the BIOS, and was on my way. The boot splash is identical to what's present in Linux Mint 9 "Isadora" GNOME, and it still looks pretty nice. It certainly looks better than the monospaced text and ugly dots that I saw in the RC of this distribution release. The boot time itself was about the same as in Pinguy OS, which is to say that it was quite short. 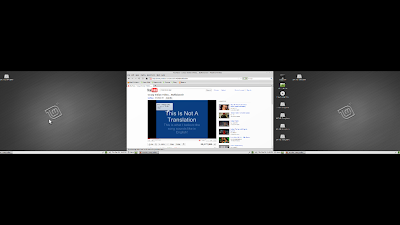 The desktop is fairly standard for Linux Mint, and it's far less cluttered and more simple in my opinion. 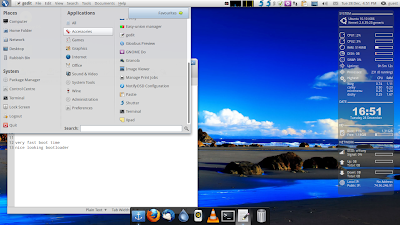 Panel applets are kept to a minimum, leaving more space for open windows in the window switching panel applet. Plus, Linux Mint is much lighter on resources than Pinguy OS; with the System Monitor and OpenOffice.org (to write this review) open, Linux Mint only uses 350 MB of RAM, while Pinguy OS requires at least 450 MB of RAM with no other programs open (based on what Conky says). That's pretty significant, if you ask me. Speaking of looks, Linux Mint has updated the classic look (version 6 and before, as it strayed from this for versions 7-9), with a dark wallpaper and a lighter-colored panel. The combination looks pretty appealing, and the wallpaper is also easier on the eyes than the Pinguy OS wallpaper(s). The default icon theme is called Mint-X, and it's a combination of different icon sets. For example, the application and menu button icons as well as the scrollbars are from Faenza, while the place icons (e.g. folders) are green versions of the Elementary icons. It's a great combination and looks much better than the default Elementary icons. That said, the GTK window decoration theme is Elementary with green accents, which doesn't provide as good a contrast between buttons as the eHomoSapien theme used in Pinguy OS. The base HomoSapien theme is configurable online and users can create and download their customized themes, so I think the Linux Mint developers should use a green version of the HomoSapien theme for the next release (version 11). The default application selection is fairly standard, with Mozilla Firefox, Pidgin, OpenOffice.org, and a couple other applications; it's nothing as vast as the Pinguy OS default application selection. Also, I'm disappointed that the Linux Mint developers still choose to include the bloated F-Spot Photo Manager over the much lighter-weight and just as feature-filled Shotwell. This is something I change every time I install Linux Mint. In addition, GNOME-Do is not installed out-of-the-box, and I'm not really sure why. 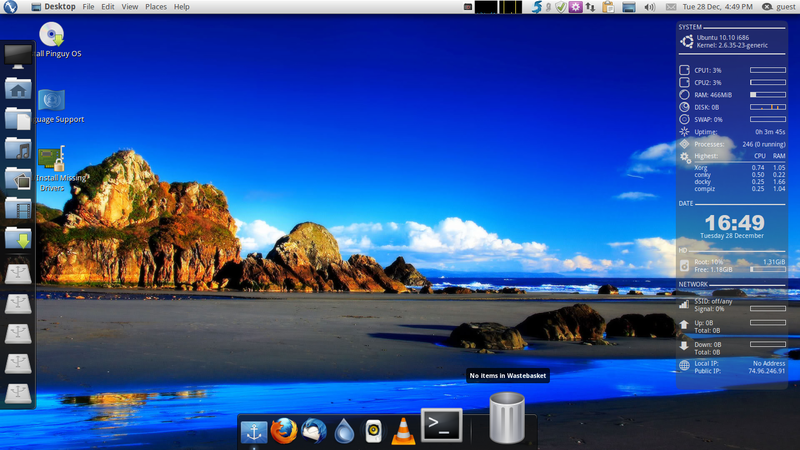 It is in Pinguy OS, and it has been in previous releases of Linux Mint. Oh well. Mozilla Firefox works well, and it feels about as fast as it does on my Linux Mint 9 installation; that also means it doesn't feel quite as fast as it does in Pinguy OS. All the codecs seem to be included. OpenOffice.org is included as well, though the theme is the somewhat more bland Tango theme as opposed to the nicer-looking Human theme included in Pinguy OS as well as past releases of Linux Mint. I'm not sure what necessitated this change, but I don't particularly care for it. That said, in my review of the RC, there were issues with the placement of the application menus in OpenOffice.org; thankfully, these issues have been fixed. 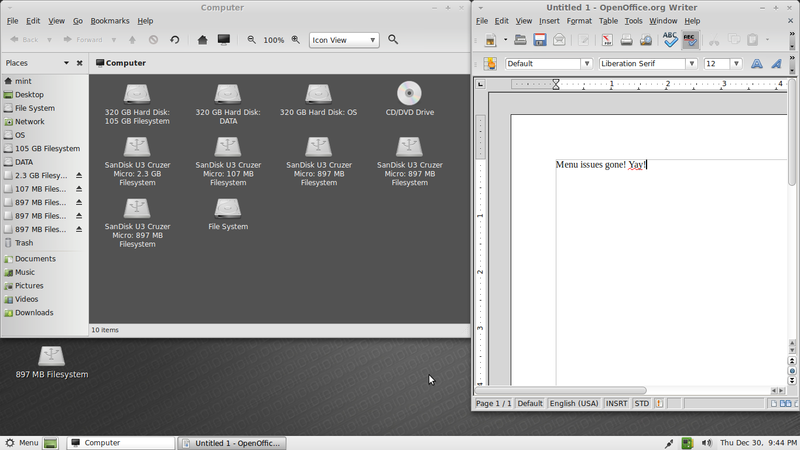 Also, unlike in Pinguy OS, OpenOffice.org had no scrollbar troubles. Nautilus hasn't been tweaked as in Pinguy OS, so in comparison, it looks quite cluttered. I do like the default look of the breadcrumbs, though. In addition, things like Gloobus aren't present either, though they can easily be installed. After installing Cheese Webcam Booth and Skype through the Mint Software Manager, both recognized my webcam and mic out-of-the-box. This also means that unlike in Pinguy OS, Skype actually signed me on in a timely manner. Desktop effects were not enabled out-of-the-box, but once enabled, they worked smoothly, though there's no shiny desktop cube background as in Pinguy OS. As in Pinguy OS, I had the option of using proprietary drivers, but I chose not to as they don't really work in Linux Mint 9, and because the open-source drivers which work quite well. I didn't have any troubles, issues, or nitpicks with Linux Mint per se (except for suspending, which didn't work and which I again will not hold against Linux Mint), but then, how does it stack up to Pinguy OS? With a more comprehensive application selection and more useful tools enabled out-of-the-box, as well as a slick-looking and simple desktop experience all around, Pinguy OS seems to be the way to go now. Plus, it'll likely appeal to newbies migrating from Microsoft Windows who want a more Apple-like experience without paying those high prices. 2. Linux Mint 10 "Julia"
It's still simple and newbie-friendly, but without things like Shutter, Nautilus Elementary, and Gloobus (among others), it seems to fall behind. Then again, those things are easily installable; plus, it'll provide a familiar experience for Microsoft Windows migrants. This article was contributed by Prashanth Venkataram, who writes at Das U-Blog by Prashanth discussing topics related to open-source software and people's freedoms relating to technology. His primary distribution of choice is Linux Mint and this article was originally inspired by the Pinguy OS review we had at Tech Drive-in a week ago.